Located in Savannah’s historic center, and anchored by the historic Prayer Book (1928) in the teaching of the Bible and the Church’s tradition. St. John’s is a spiritual home for those seeking reverent and dignified worship in fidelity to the teaching of Scripture, in a fellowship of orthodox faith and loving service, and to grow spiritually in holiness of life. All are welcome to join us for worship, in the ministry of the word and in the prayers. Visitors who are baptized and have been admitted to communion in their own churches are welcome to receive communion. Visitors who are not baptized Christians or who have not been admitted to communion are welcome to come forward during the Communion to receive a blessing. The atmosphere is reverent, dignified, meditative, and formal. Most of the congregation dresses up for church (jackets for men, equivalent attire for women). Sunday services at 8 a.m. and Noon are usually quiet and meditative, focusing on the words of Scripture, the prayers, and the Sacrament. The main service at 10:30 a.m. service is more “extroverted”, and perhaps most suitable for a first-time visitor, with the addition of an opening procession, choral and congregational singing, a sermon, prayers, and (after the service) by the congregation’s gathering with visitors and guests for delicious refreshments (Coffee Hour) in the Green Meldrim House. About half of the Sunday services at 10:30 a.m. are the service of Morning Prayer; the other about half the Sundays of the year half are the sacramental memorial of Christ’s saving sacrifice, the Eucharist or Holy Communion. For more details on our regular services click HERE. For Christmas and Easter, consult the Church calendar click HERE. In the Anglican tradition the services follow fixed forms of words and actions set forth in the Prayer Book, which allows everyone to take part in the service. All services at St. John’s are based on the biblical and historic tradition of worship transmitted in the 1928 Book of Common Prayer, and the 1940 Hymnal. In these services, the biblical and historic substance of Christian worship is presented in words and actions of time-tested clarity, dignity, and beauty. We worship the Lord both visible and invisible – both in body and in soul. The outward and visible aspect of worship – ceremonial, vestment, and ornament – is of great importance in the Anglican tradition of worship. The ceremonial can be either simple or elaborate, but you may see some movement among those around you during a service, including standing, sitting, kneeling, making the sign of the cross, genuflecting, and bowing, at specific points during the service. There will be times that the congregation will recite prayers and creeds together. If you are new to a tradition of formal worship, we encourage you to participate without any concern for “doing things correctly.” Everything you need to know to fully participate will be provided to you in a detailed worship booklet handed out by ushers at the door. We want your visit to be comfortable so that you may fully experience God’s presence through worship and fellowship, whether you are just visiting or looking for a church home. We are very proud of our beautiful and historic church building and would like to share it with the community. We encourage you to visit us. When available, St. John’s Church is open to visitors each weekday, 11:00 a.m. to 1:00 p.m. and with guided tours available. Private group tours are available by appointment. As families come to worship at St. John’s Church, we want them to feel safe, welcomed and loved. Our Ministries with Children and with Youth provide opportunities for Christian spiritual growth, education, service, and fellowship to support the spiritual formation of your children. Register and check-in your children in the Foyer of Cranmer Hall. Nursery for newborns through age 3 is available in the first floor of Cranmer Hall from 9:15 a.m. until the end of the 10:30 a.m. service. Pre-school and Kindergarten Children’s Church is available from 10:15 a.m. to the end of the 10:30 a.m. service. All potty-trained infants and toddlers aged 3 through Kindergarten are welcome to this class. Children in Grades 1 to 5 are encouraged to begin with their family in the Church at 10:30 a.m. and follow the cross during the hymn before the sermon (as indicated in service booklet) to Cranmer Hall for age-appropriate Children’s Church. Youth from Grade 6 upwards take part in Sunday School from 9:30 a.m. to 10:15 a.m. in Cranmer Hall, Grade Six Catechism; Middle School; and High School classes. We hope your entire family will Connect, Grow, and Serve with us at St. John’s Church! Safety: All employees and volunteers who work with Children and youth are screened and certified in Safeguarding God’s Children. Please CLICK HERE for our Safeguarding God’s Children guidelines and procedures. Let Us Get to Know You: Please be sure to fill out a Visitor card and drop it in the offertory plate so that we may connect with you and answer any questions you may have about St. John’s. Parking: Conveniently available in the lot on the west side of Whitaker Street. 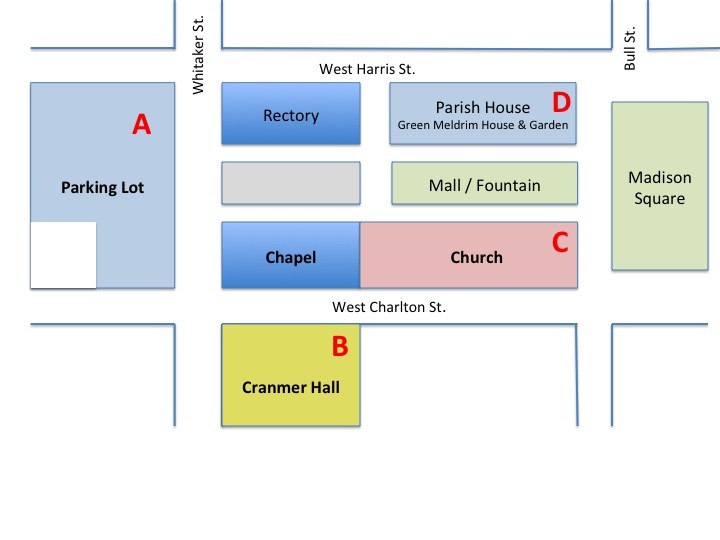 Restrooms: Are located in Cranmer Hall (at the South West corner of Charlton Street and Whitaker Street), and there are smaller facilities in the church itself (ask an usher at the door for directions). Want to know more about our weekday pre-school? Questions about Children’s and Family Ministry? Email info@stjohnssav.org. Click here for a St. John’s Church campus map. Click here for walking or driving directions to St. John’s Church campus.